This second issue comes in a brand new form, with a new title (VIEW), a new URL (viewjournal.eu), a fresh design and a new member on the team of editors-in-chief: John Ellis from Royal Holloway, University of London.The journal makes use of an open access publishing system, OJS, and has developed a tool to insert relevant audiovisual sources in the online reading experience. The journal also received a redesign to maximise readability. The new name, VIEW, indicates a clear vision for the future of the Journal of European Television History and Culture. 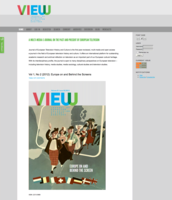 View, the Journal of European Television History and Culture, is published by the Netherlands Institute for Sound and Vision in collaboration with Utrecht University, Maastricht University and Royal Holloway University of London. With its interdisciplinary profile, the journal journal is open to many disciplinary perspectives on European television – including television history, media studies, media sociology, cultural studies and television studies. Read more about the journal. View is made possible by support from the EUscreen project and the Netherlands Organisation for Scientific Research (NWO). The journal works in partnership with the European Television History Network. EUscreen started in October 2009 as a three-year project, funded by the European Commission’s eContentplus programme. Over the project’s duration more than 40,000 items representing Europe’s television heritage (videos, photographs, articles) have been made available online through a freely accessible multilingual portal. EUscreen makes thousands of items from Europe’s television history freely available through its online portal and through Europeana. The project now announces its online exhibitions, a new addition to the portal that helps users, educators and the general audience to get the most out of this exciting collection.